I am up early this morning determined to continue thinking-in-writing about the phenomenon being discussed over the weekend – the disintegration of the Republican Party with the foolishness of Donald Trump. The processes of disintegration have been unfolding for the past year and I question the depth of analysis and understanding that so far has emerged. Listening to Fox, CNN, and MSNBC’s talking-heads does not give one any assurance that they understand the historical dynamics of what is going on. What we have been getting are references back to 1964 Barry Goldwater’s bid and back to the 1968 Democratic Convention riots. However Zizek’s reference to Italy’s past Trickster president Silvio Berlusconi and comparing him to the Fool Donald Trump is interesting and suggests the idea of examining what the Tarot Cards can offer in understanding what is unfolding. I have had my Tarot cards read many times in the past by my dear high school friend, Kenny Pier, who had MS for 40 years and died two years ago. I now have both of his Rider Tarot Card Decks and one of my own he encouraged me to buy. There are different ways to consult the Tarot Oracle and I remember Kenny asking me how I saw myself each time I returned from China for a visit and a reading. Over the years my responses changed as I grew in my profession from seeing myself as a Knight, then a King, then an Emperor, and finally as a Magician. I remember wal king into Kenny’s nursing home to get my cards read and in the open lounge performing for the residents was a magician. I was startled, stopped to watch, and saw over a chair was the magician’s overcoat – the exact color and style I was wearing. I realize then that I am a magician. I have Kenny’s readings type-recorded and will soon be re-playing them – back to the future! In re-arranging my hard drive last week, I came across two photos of Ke nny as a young man and with “The Fool” on my mind, I thought back to the many Tarot sessions we had had. However, I am not interested in getting a reading for T rump and have been informed that we would need to get Trump involved in order to properly do that. So, it occurred to me why not begin understanding the Trump experience by looking into what The Fool has to say about himself. With what is going on in the US’s election processes, many are dismissing Trump as a Fool. So, what is this archetype about and can we gain any insight into what is unfolding? In seeking insight from The Tarot without Trump being involved, I uncovered an idea in this clip Tarot Cards use in history. It explains how The Fool is the zero card and is guided by The Magician on his journey through the Major Arcana (greater secrets) or of all names the trump cards. So, here we have The Fool, Trump, being guided by A Magician moving systematically through the Arcana Cards on a Fool’s journey toward enlightenment, individuation, to The World – or in our investigation Trump’s journey to the presidency of the United States. May I suggest to really test our doors of perception, that we now lay-down the Major Arcana cards, then identify where Trump is on his Arcana Card journey, and then see if we can anticipate what is unfolding for The Donald, a Fool on his journey? It is important to remind ourselves that we are all Fools on a Journey guided by The Magician. See you at Woody’s for beers! 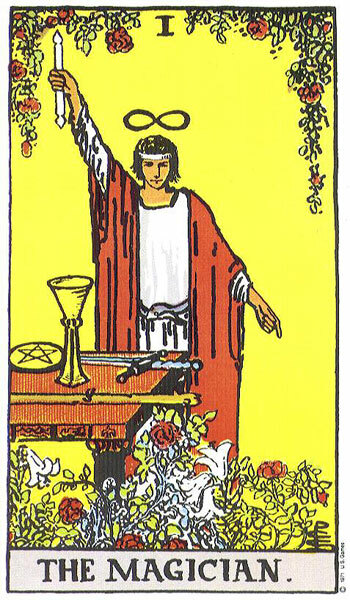 Another image in looking at the Magician card we see a young man/woman pointing to the earth and holding up to heaven in his right hand a scroll of knowledge. Above his head is the symbol of what is sought – the mathematics of infinity. And on his table are the instruments at his command, a coin, a cup, a sword, and a staff. So, after thinking about what I wrote about the fool being assisted by a Magician moving systematically through The Major Arcana Cards, I am thinking, it might be modified to Donald Trump or anyone on the journey of life is not encountering the Acrana Card experiences sequentially but has to consider the Tarot Cards describe as a hologram with each card containing the whole deck. So, as ones travel along the road of life and it appears that one card is being encountered one needs to be aware that all the cards are in play at all times as in a “holographic universe.” Michael Talbot’s work with the holographic universe is explored in this interview with Jeffrey Mishlove and explaines what I am suggesting. The synchronistic element is not fully addressed in this first part and really plays a key role in fully encountering the Tarot Cards – more on that later. Whichever party wins the Presidency, the magician is guiding Trump into events that reflect an already broken Republican Party, this happening right in from of our eyes on TV. But Republicans will be reborn in new ideas, with stronger solid views. The Trump event is a mirror reflecting Republican traditional ideas need a big change because they are no longer feasible and in fact, are dangerous. American Socialism guided by foreign (European) thought?